Continuing its efforts to woo enterprise users in heavily regulated industries, Box on Monday announced a new add-on tool for its cloud storage service that's designed for managing sensitive data. Box Governance targets organizations in areas such as financial services, healthcare and higher education, and aims to help users comply with regulatory policies, satisfy e-discovery requests and effectively manage sensitive business information such as credit card numbers or social security numbers. The new service comprises three key capabilities. First is a retention-management feature that had been in beta since February, when Box announced its cloud offering tailored for financial services firms. Now generally available, the feature allows users to set automated policies for controlling the preservation and deletion schedules of their organization's business documents. 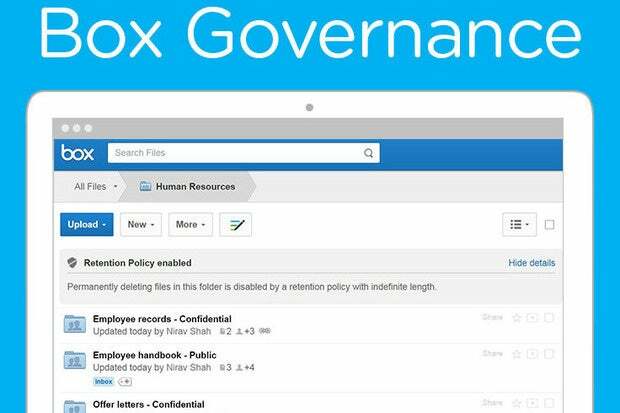 Second, Box Governance lets users set content security policies, including the ability to prevent or flag downloads, uploads or sharing of sensitive information. Finally, a feature focused on e-discovery gives enterprises a way to identify and preserve documents and critical metadata while also preventing the deletion of information, enabling them to comply with legal discovery requests. The retention-management capability was particularly essential for users in financial services. Box said it now offers full compliance with Financial Industry Regulatory Authority (FINRA) and U.S. Securities and Exchange Commission (SEC) 17a-4 requirements, allowing Box customers at investment banks and securities firms to abide by the rules governing the way their broker-dealer records are stored, maintained and deleted. Both Box and Dropbox have been racing to allay concerns enterprise users have long expressed about cloud storage. Just last week, Dropbox announced that it will soon offer enterprise mobile management capabilities. Box introduced a similar feature late last year.